Belthangady May 09, 2016: Finally the mystery behind Vinutha’s death is solved with the help of her post-mortem report that she died due to poisoning. The case was suspicious because she died on March 30, a day before her wedding. It is said that the Vinutha’s parents were insisting her to marry Pratap. The report reveals that she had consumed rat poison to end herself. Vinutha started vomiting at her workplace. She was admitted to the Hospital immediately and was discharged after medication. She began vomiting the next day again, was rushed to the Hospital by her family. She did not respond to the treatment and died. 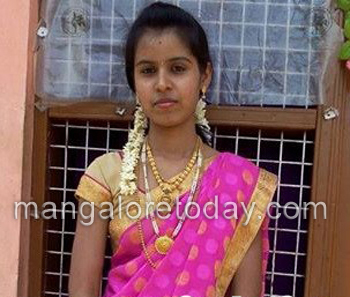 Vinutha’s parents promise to Prathap’s family might have forced her to take the extreme step.